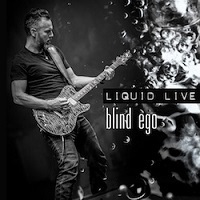 BLIND EGO is the solo project of RPWL guitarist Kalle Wallner, and he also owns the record label “Gentle Art of Music.” The studio album “Liquid” was his third solo effort, and we have the live version of that album here, which contains ten tracks. “A Place in the Sun” opens the album. A tense build up slowly occurs, to the obvious pleasure of the audience. Some electronica in the background soon gives way to a big opening riff, dark in scope. Hitting the verse, it retreats and the focus is on the vocal delivery. But when that big riff hits again, it makes an impact. The chorus delivers a good deal of melody as well. “Obsession” gets a rousing response as well. A more traditional riff rolls along in this mid-tempo number. The tender gloom of “Not Going Away” has a drawn out resolve that is strong and weighted but also breathable at the same time. “Never Escape the Storm” has an expressive and forbidding quality, reminding you that you will never fully escape the storm. The crowd claps along to the beat before a crushing guitar riff captures the ominous nature of the message. “Death” is about a final of a word as it gets. At first it’s fairly depressing in scope, but the glossy shine of the chorus, though remaining despondent, touches on that “beauty in darkness” concept. The audience responds approvingly to the energy of the instrumental section. “Hear my Voice out there” brings the energy hard with a rousing riff and the steady thud of bass guitar. A dueling guitar battle never disappoints as well. “Blackened” was release as an official video, so the audience is familiar with this song for sure. It has a pensive quality with wonderful harmonic vocals in the chorus, and oozing with personal substance. In “Tears and Laughter,” they talk about “some good thing and some bad things.” It has a heavy, punchy rhythm at first and then softens up, like meeting someone for the first time who takes a while to let their inner feelings show. Side projects and live albums are two ways that a fan can really make a connection with a musician and artist. Free from record label reigns, they can dig deep into the kind of compositions that they feel in their soul. You definitely have the feeling of that here with “Liquid Live” from BLIND EGO.